It’s back again…Vote Heads or Tails and you may just win a Free Papa John’s Pizza. 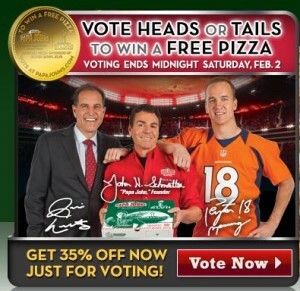 Vote in the Papa John’s Super Bowl XLVII Coin Toss Experience before February 2 @ 11:59 p.m. PST. If you call it right, you will win a FREE large 1-topping pizza. This entry was posted in Expired by mlemon317. Bookmark the permalink.